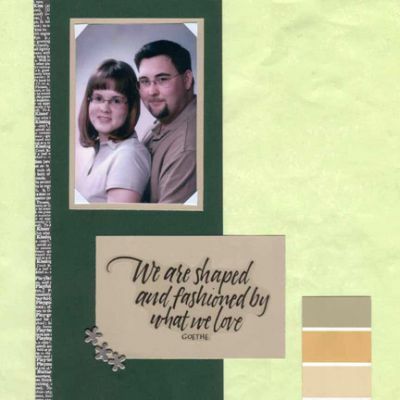 You can also share your love scrapbook layouts on this site. A dedicated page has been created for you to upload and share your own love scrapbook layouts, Baby Scrapbook Layouts, Family Layouts, Wedding scrapbooking Layouts etc. Alternatvely you can just go to your Scrapbooking Layouts Page and choose the most relevant scrapbooking theme for your Scrapbook. ...But we can somehow manage to steal an hour here, thirty minutes there to chronicle our feelings we all experience but don’t often share. With these love scrapbooking ideas you can recapture those lovely moments, and give substance to your feelings. Remember, don't lose your love memories, use these love scrapbook layouts ideas to preserve your love memories. Express your love by using these love scrapbooking ideas to create a loving and unique love scrapbook for your love. Return from your love scrapbooking layout page to Love Scrapbook Layouts Gallery Home Page.